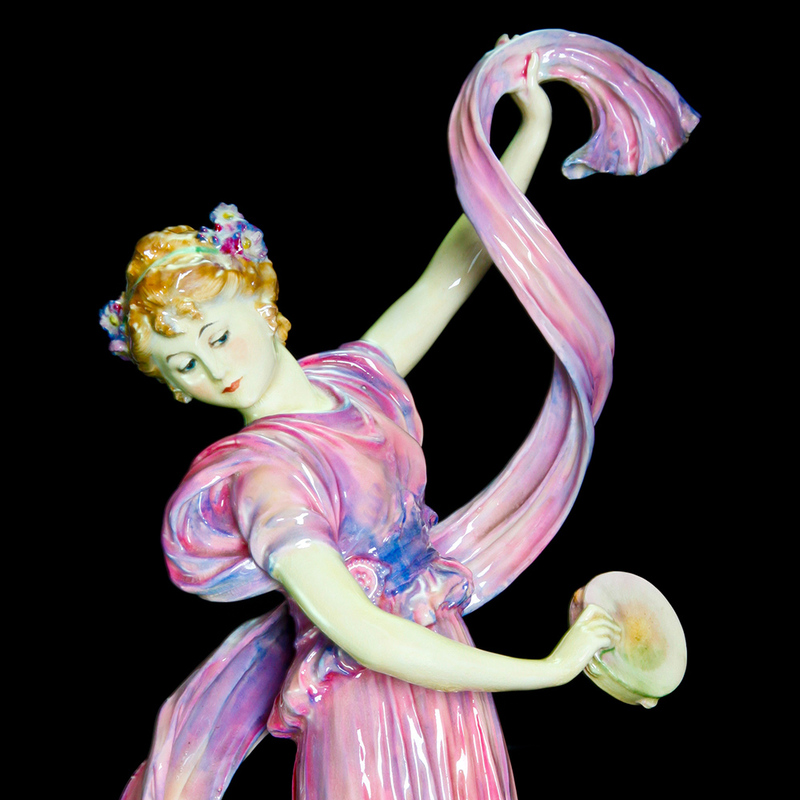 The Dancer was gifted to WMODA by Caroline D’Antonio and is one of the rarest Royal Doulton figures in the collection. 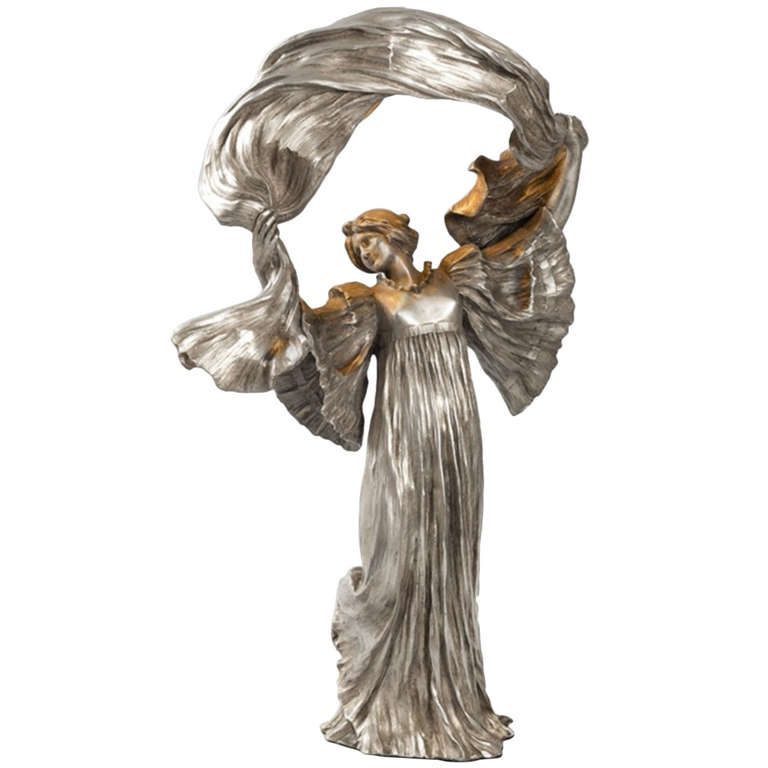 It was modeled by Charles J. Noke after the dancer Loïe Fuller, who was the toast of the Folies Bergères in Paris at the turn of the 20th century. La Loie, the Electric Fairy, became a blazing symbol of the Belle Epoque and the personification of the new aesthetic styles of Art Nouveau and Symbolism. Miss Fuller was born Marie-Louise in 1862 on a farm in the American Midwest and began her stage career in the boom town of Chicago as a child performer in melodrama, farce and burlesque. Supposedly, she created her famous Serpentine dance in 1887 after she became tangled in her long dress and avoided falling by spinning the fabric in graceful gestures. Her ground-breaking choreography progressed into a frenzied manipulation of dramatically lit fabric supported by bamboo poles to elongate her arms. 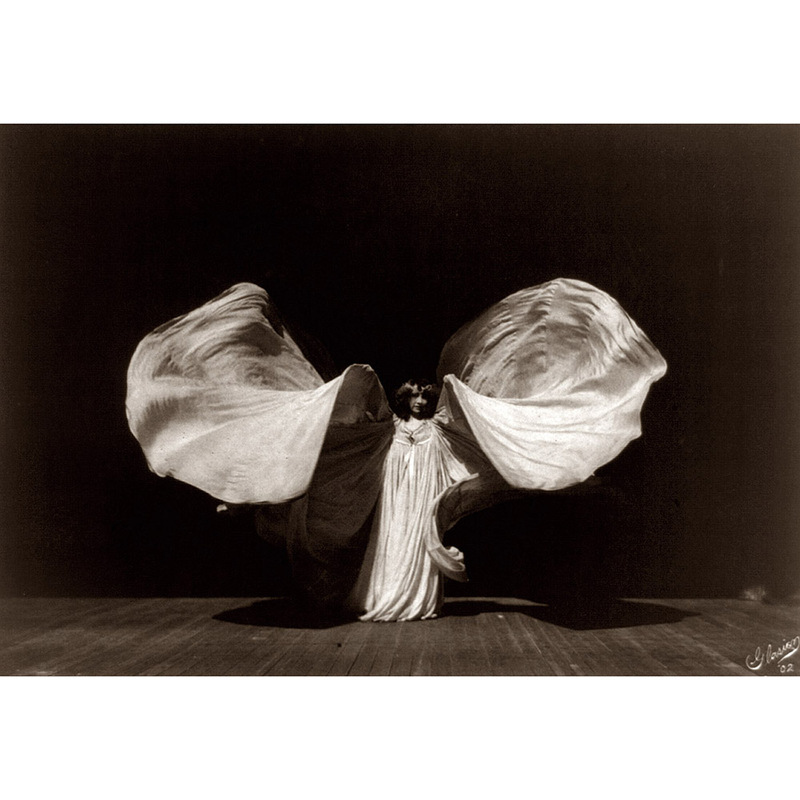 Her swirling, voluminous silk costumes and magical lighting effects seemed to transform her into a butterfly or a lily. When imitators copied her radical new dance style, Loïe moved to Paris where she dazzled new audiences at the Folies Bergères. The Dancer movie, released in Europe last year, tells the story of her career including her relationship with her star protégée, Isadora Duncan. La Loïe was written about, painted and sculpted by most of the important artists in Paris, including Toulouse Lautrec, Alphonse Mucha and Auguste Rodin. 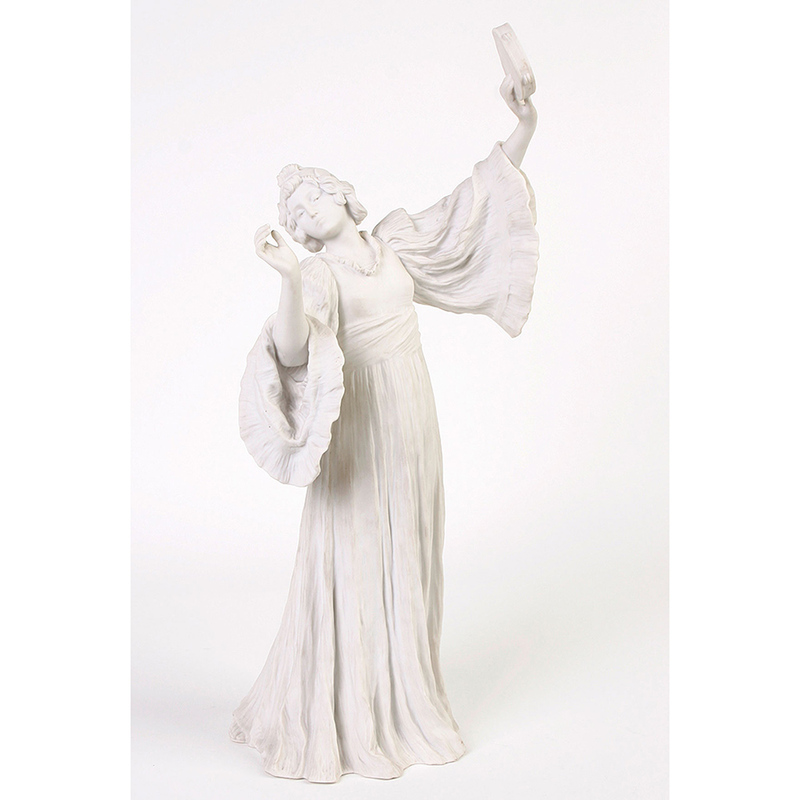 Ceramicists were also inspired by her sensational performances, notably Agathon Leonard who designed a set of 15 dancing figures for Sèvres. The figures were shown at the Paris exhibition of 1900 where they sold out and were re-issued several times during the 9 months of the fair. They were also produced in bronze editions of different quantities and sizes. 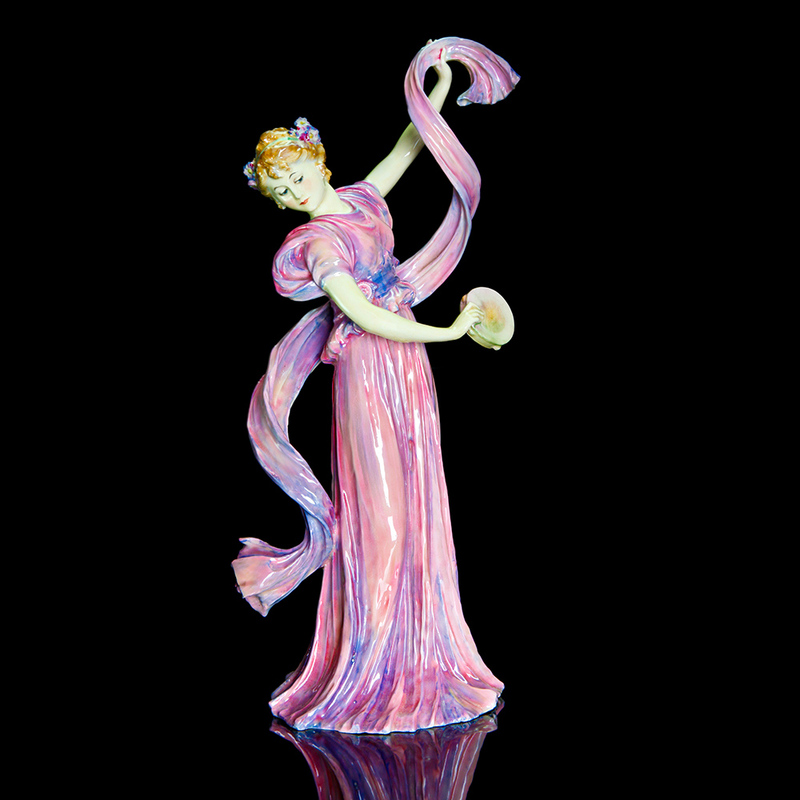 The Sèvres dancers in turn inspired Charles Noke to produce his Royal Doulton dancer which joined the HN collection in 1920. The figure does not appear to have gone into full production as only two are known to exist.